If you enlarge this image (by clicking on it), you can see that you’re looking into the sun late in the afternoon from the Taneytown Road. You are looking at the back of the New York Auxiliary Monument, and to its left, the barn at the Klingel Farm. 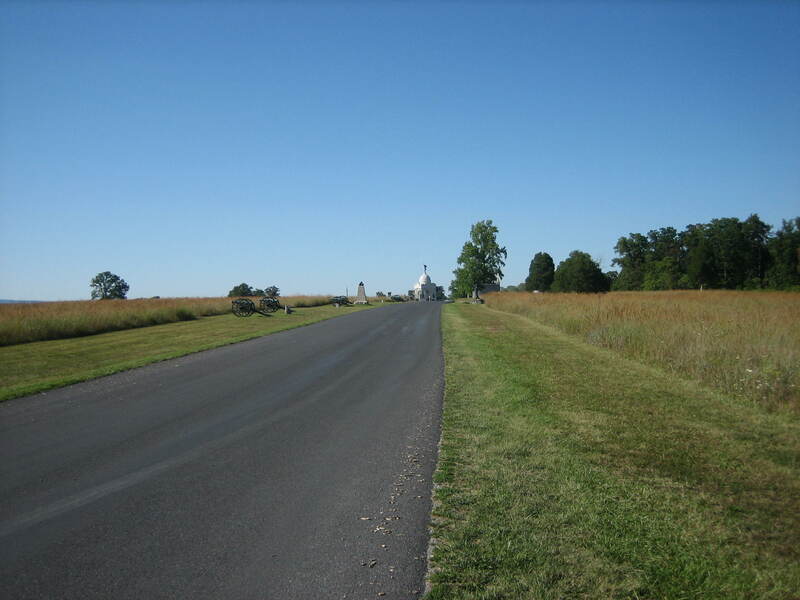 The Klingel Farm is located on the east side of the Emmitsburg Road. This view was taken from the east facing west at approximately 5:00 PM on Tuesday, September 2, 2008. 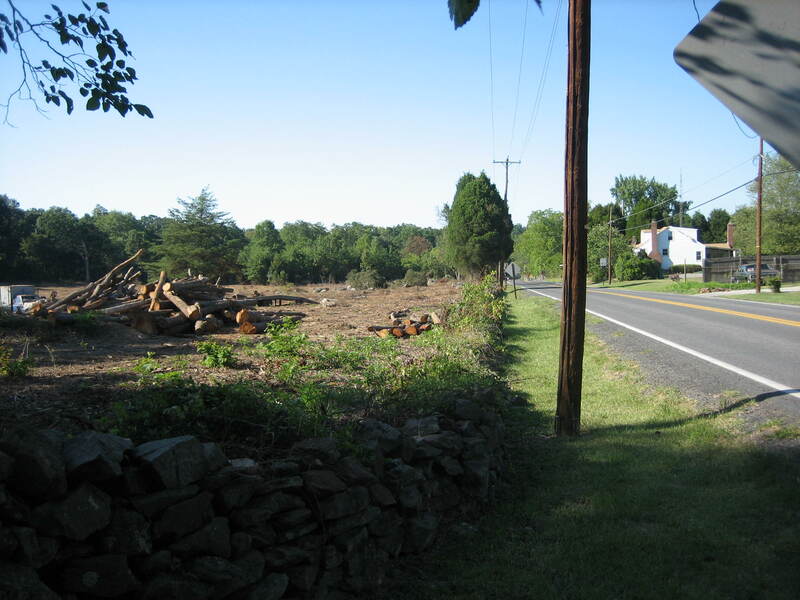 The Battlefield Rehabilitation (tree cutting) between the Taneytown Road and Cemetery Ridge shows how high the Taneytown Road is in this area. 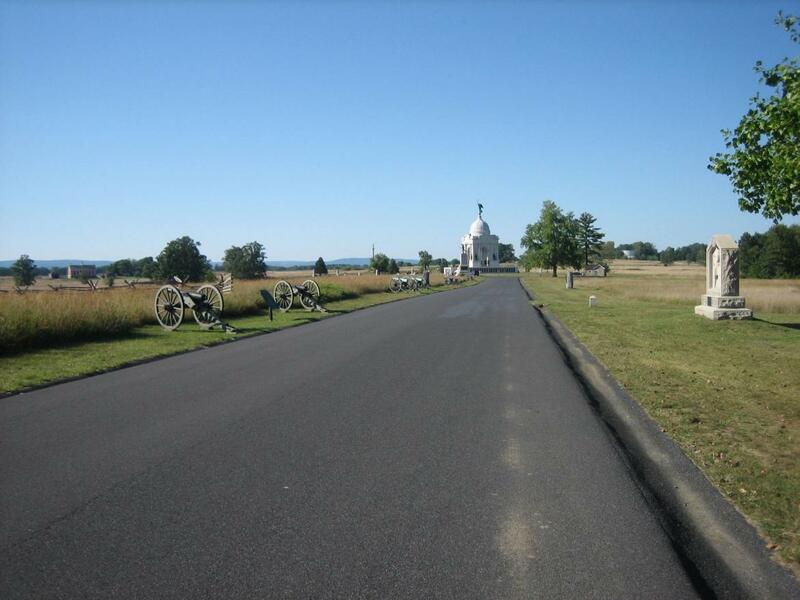 One can now look from the Michael Frey Farm, which is located east of the Taneytown Road near Artillery Ridge Campground, and look to the west, not only to Cemetery Ridge, but to the Ridge along the Emmitsburg Road, and the mountains to the west. 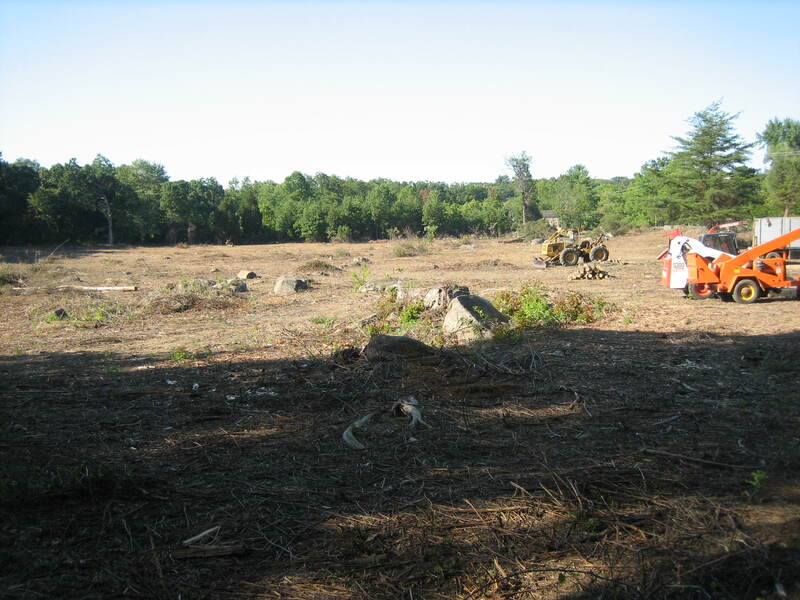 See our previous posts of the work in this area on August 15, 2008, August 9, 2008, and July 18, 2008. In the previous photograph, the photographer was standing on the west side of the Taneytown Road near the Michael Frey House. This view was taken from the west facing east at approximately 5:00 PM on Tuesday, September 2, 2008. To show this from another direction, we are now on Hancock Avenue near the New York Auxiliary Memorial looking back towards the Michael Frey House. 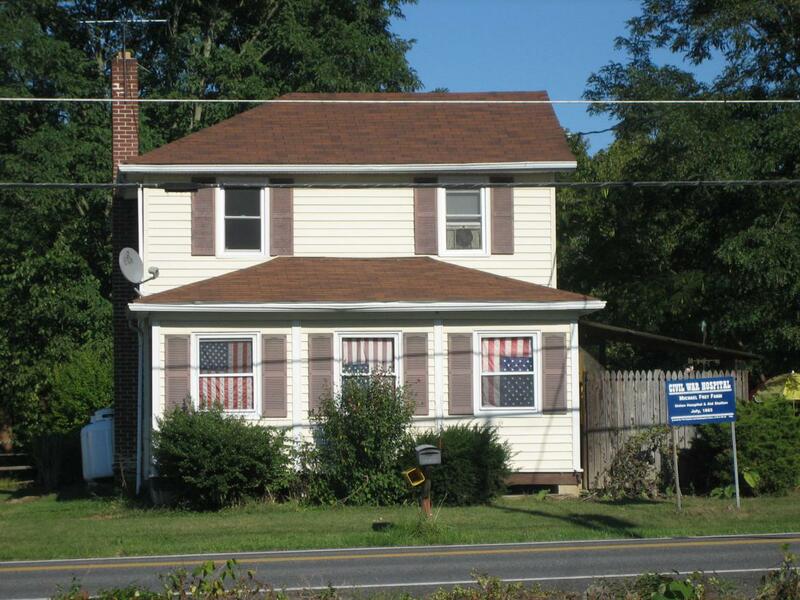 If you make this image larger (by clicking on it), you can see a car to the right front of the house traveling north on the Taneytown Road. 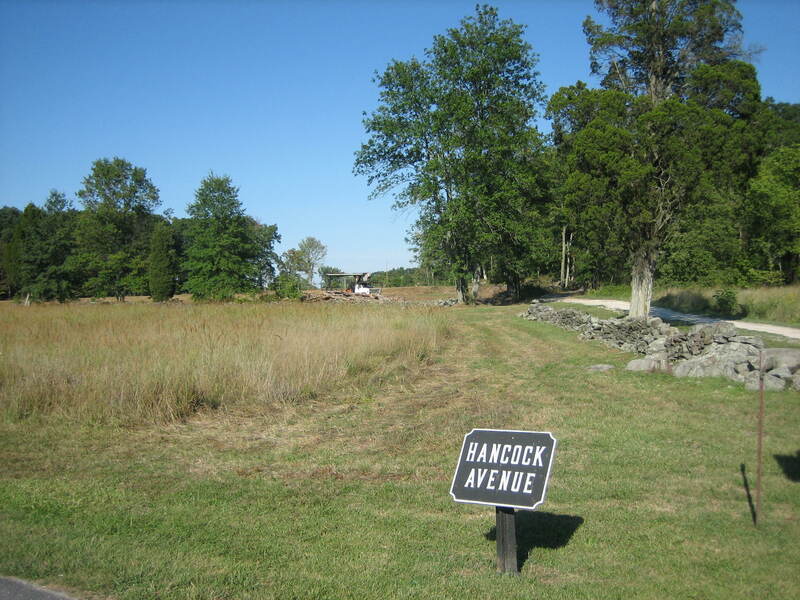 The point we are attempting to make is that in this area, the Taneytown Road is approximately the same height as Hancock Avenue. This view was taken from the west facing east at approximately 5:00 PM on Tuesday, September 2, 2008. 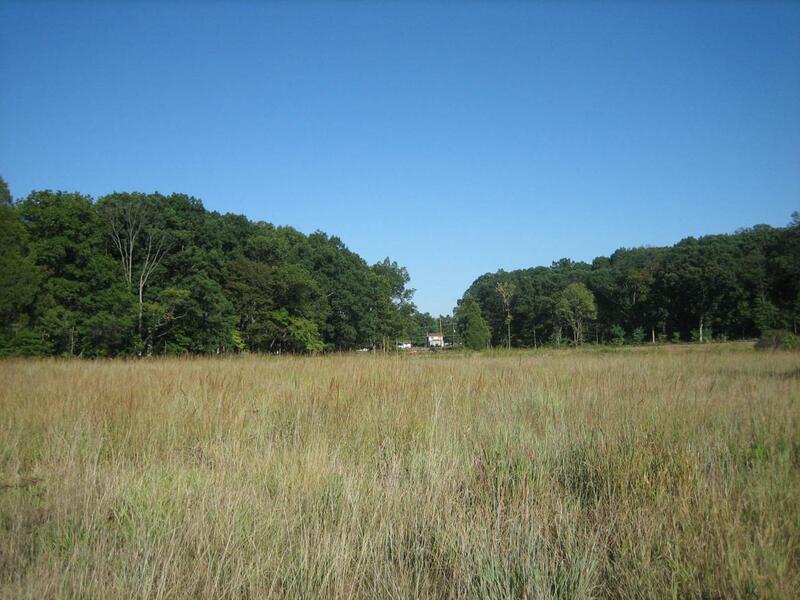 We’ll take a walk around this area starting at the point where the horse trail crosses the Taneytown Road near the Michael Frey Farm and Artillery Ridge Campground. 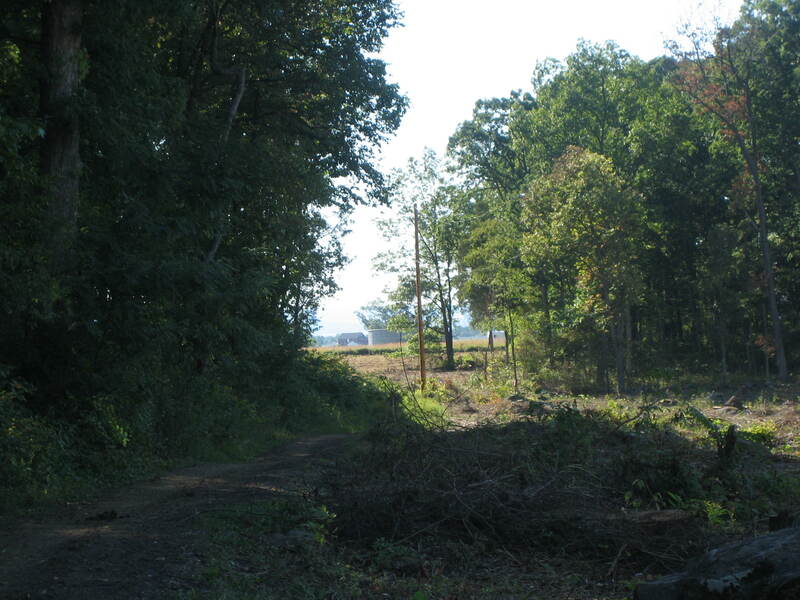 The Taneytown Road is on the right, and the newly cleared area is on the left. 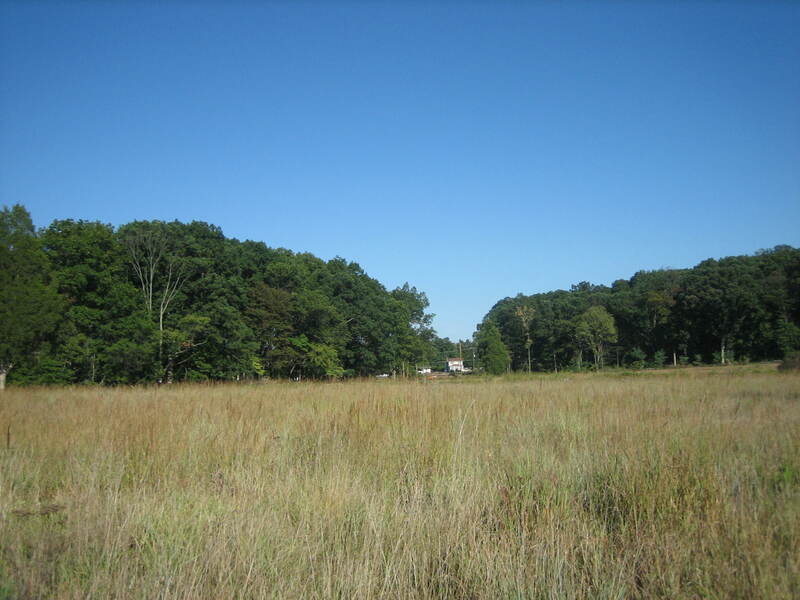 This view was taken from the south facing north at approximately 5:00 PM on Tuesday, September 2, 2008. Here is more of the area that has been cleared. The William Patterson House (see our posts of August 11, 2008 and August 15, 2008) is visible over the yellow piece of equipment. This view was taken from the southwest facing northeast at approximately 5:00 PM on Tuesday, September 2, 2008. Notice as we go up Cemetery Ridge, in the same direction that Lockwood’s Brigade would have moved on July 2, 1863, the bottom of the New York Auxiliary Monument is out of sight, and the Klingle Barn is no longer in view. This view was taken from the east facing west at approximately 5:00 PM on Tuesday, September 2, 2008. If you enlarge this photo and look through the glare you can see the horse trail on the left, the Abraham Trostle Barn in the left background, and the Joseph Sherfy Barn in the right background. 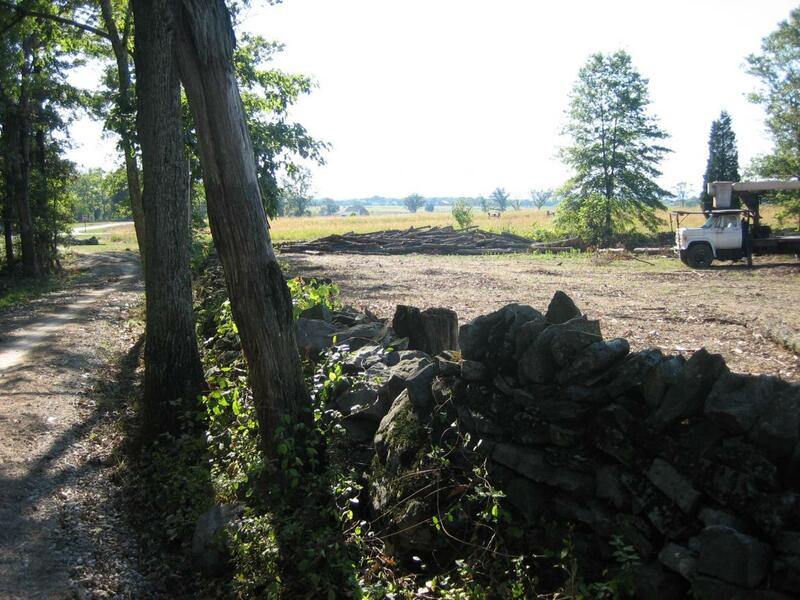 See our post on the Joseph Sherfy Barn on August 29, 2008. See our post on the Trostle Barn on March 25, 2008. This view was taken from the northeast facing southwest at approximately 5:00 PM on Tuesday, September 2, 2008. We’ve now reached the intersection of the horse trail with Hancock Avenue. 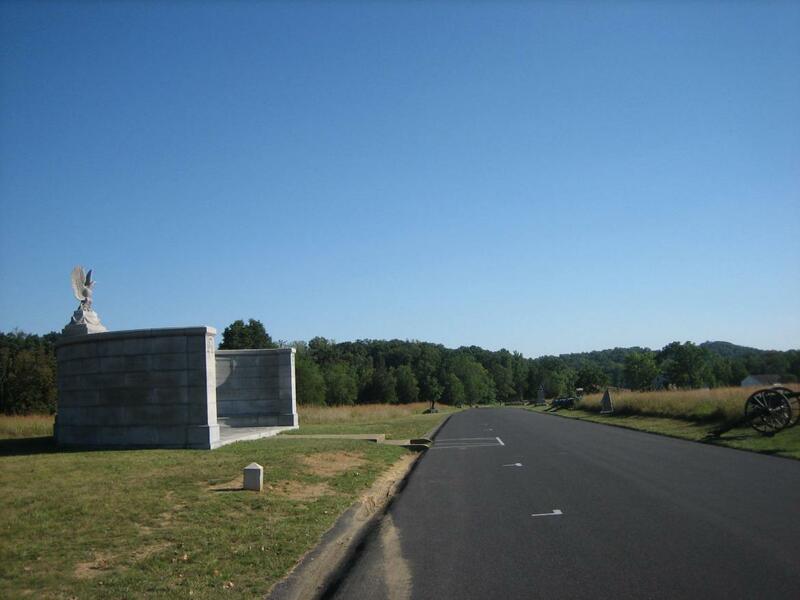 This view was taken from the southwest facing northeast at approximately 5:00 PM on Tuesday, September 2, 2008. Since we’re showing you the subtleties of Cemetery Ridge, here’s another one mostly has nothing to do with the battlefield rehabilitation (tree cutting). We are walking north along Hancock Avenue and we are actually going uphill. If you make this image larger, you will notice that you can’t see the bottom of the Pennsylvania Monument with its brown panels. This view was taken from the south facing north at approximately 5:00 PM on Tuesday, September 2, 2008. As we get closer to the statue of Father Corby (See our post on Father Corby on May 7, 2008) we can begin to see the bottom of the Pennsylvania Monument. This view was taken from the south facing north at approximately 5:00 PM on Tuesday, September 2, 2008. 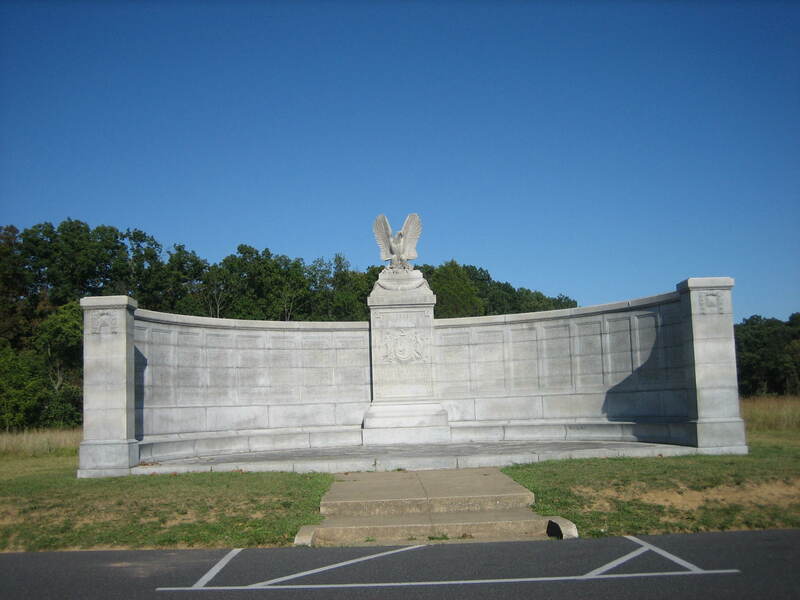 As we get closer to the New York Auxiliary Memorial, we can see the bottom of the Pennsylvania Memorial. Now we can better understand why the New York Auxiliary Memorial is located in this area. 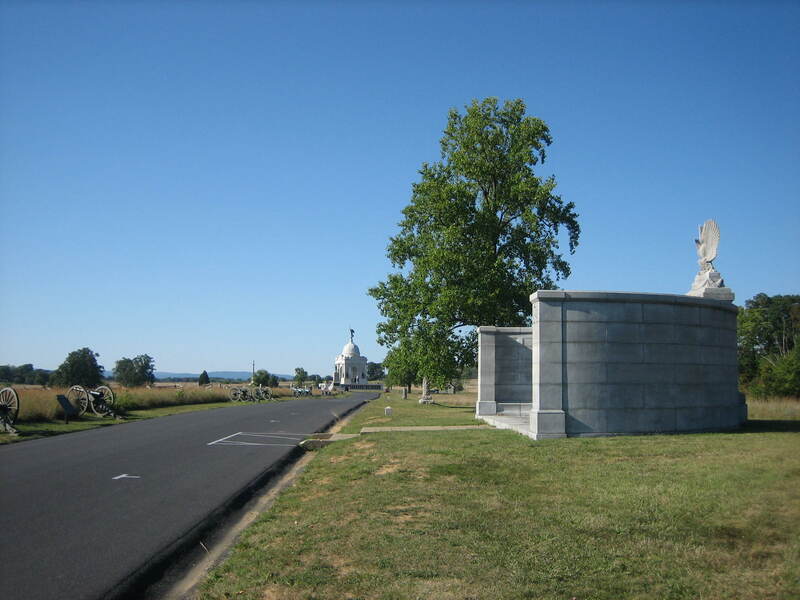 This is the highest point of this section of Cemetery Ridge. This view was taken from the south facing north at approximately 5:00 PM on Tuesday, September 2, 2008. The New York Auxiliary Monument was dedicated on September 9, 1925 at a cost of $27,875. 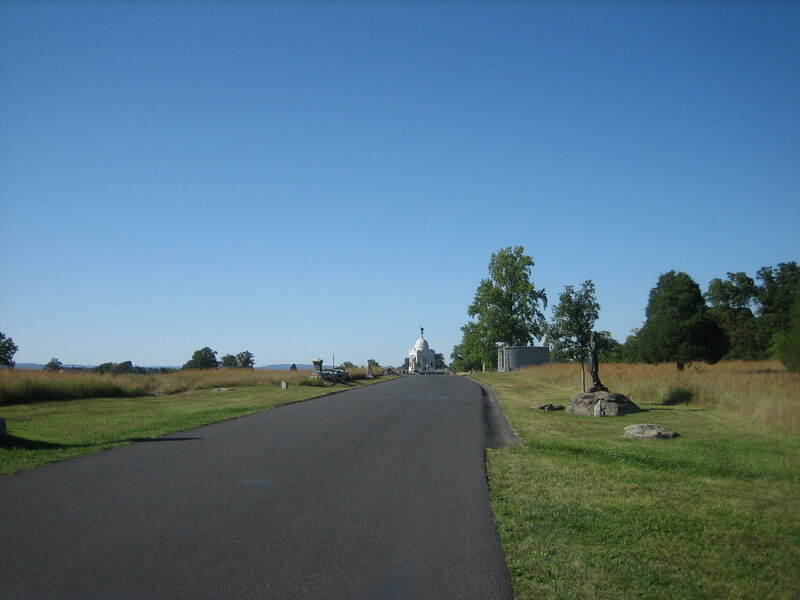 It is made of Concord Granite and honors all New Yorkers who commanded military units at Gettysburg from the ranks of Major to Major-General. This view was taken from the west facing east at approximately 5:00 PM on Tuesday, September 2, 2008. From this point one looks downhill toward the George Weikert Farm… This view was taken from the north facing south at approximately 5:30 PM on Friday, August 15, 2008. … or downhill to the Pennsylvania Monument… This view was taken from the south facing north at approximately 5:30 PM on Friday, August 15, 2008. … or east back to the Michael Frey Farm on the Taneytown Road. 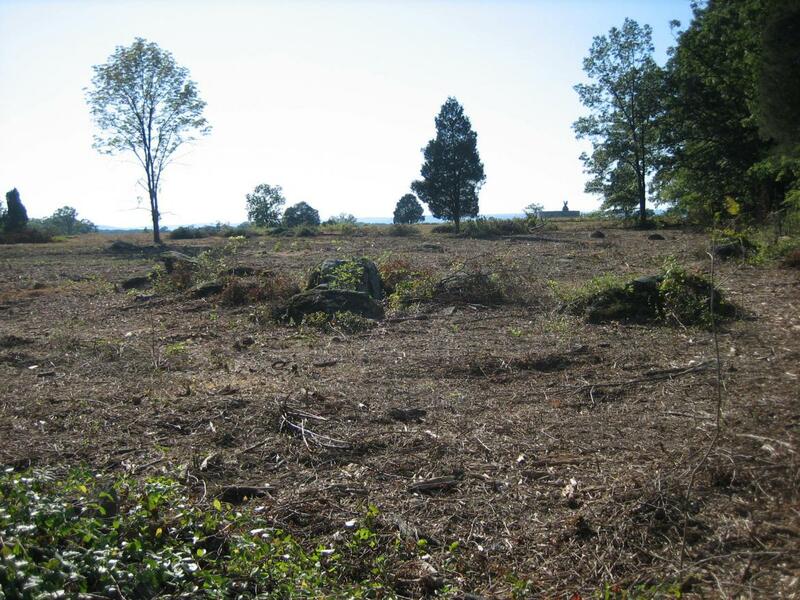 Again, the Taneytown Road appears to be at the same height as this high point on Cemetery Ridge. This view was taken from the west facing east at approximately 5:30 PM on Friday, August 15, 2008.